Kingsley Burlinson, Burlinson Geochemical Services Pty. Ltd.
36 samples from the Tanami region were analysed by decrepitation to compare the results with previous heating stage results from the same samples carried out by the N.T. Geological Survey. The samples were analysed without knowledge of their locations or geology or fluid inclusion data and this report is a summary of the raw data. Partial geological and location information was later provided by the geologist and a subsequent interpretation compares the decrepitation data with microthermometric and location information. A geological summary of the tanami area incorporating the decrepitation and fluid inclusion data was published by the N.T. geological survey. 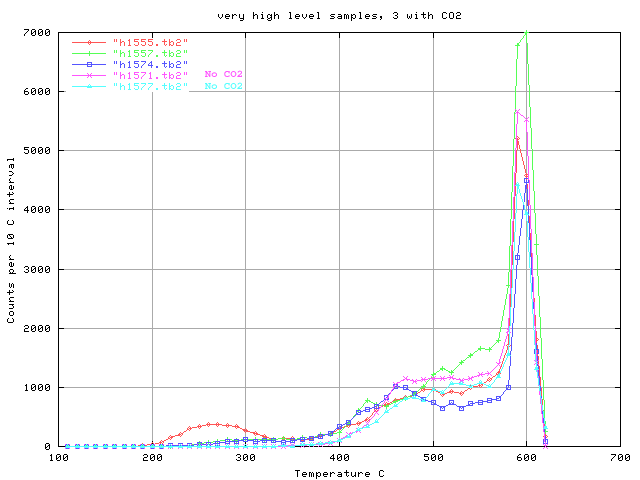 The decrepitation intensity of the samples varied widely and so these results have been grouped by decrepitation magnitude in the following plots. 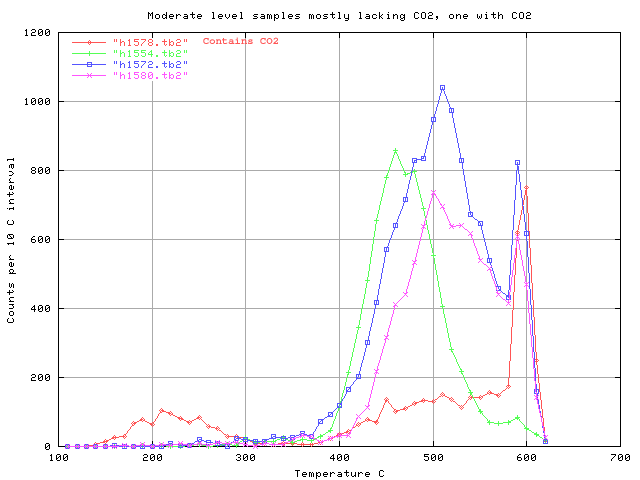 The presence of CO2 is indicated by decrepitation up to 300 C (BURLINSON, K. (1988) - An instrument for fluid inclusion decrepitometry and examples of its application. Bull. Mineral. 111, 3-4, 267-278. ; MAVROGENES, J.A., BODNAR, R.J., GRANEY, J.R., McQUEEN, K.G. and BURLINSON, Kingsley (1995) - Comparison of decrepitation, microthermometric and compositional characteristics of fluid inclusions in barren and auriferous mesothermal quartz veins of the Cowra Creek gold district, New South Wales, Australia. J. Geochem. Explor. 54, 167-176. ). 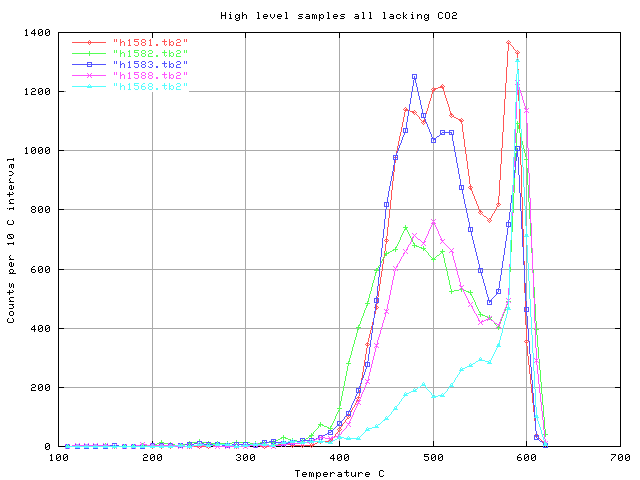 In each plot the CO2 containing samples are listed first. 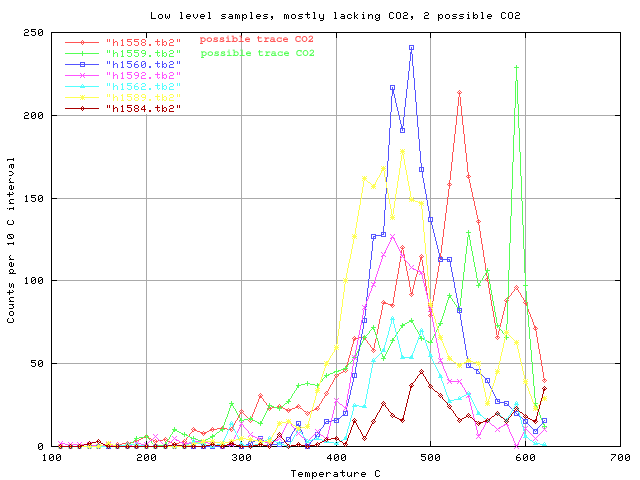 To convert the analytical run numbers in the plots to geological sample numbers refer to the cross-tabulations. 7 samples were analysed in duplicate for quality control - see the DUPLICATES information. Most samples used were 0.5 grams, but 3 samples were re-analysed using 1.5 gram samples. In these plots the larger sample results are presented in these cases. 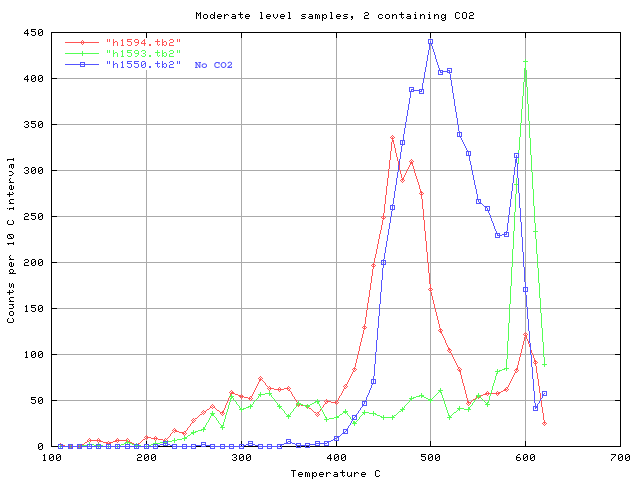 Many samples contained traces of carbonate, which interferes with the results. All samples were tested during preparation and washed with HCl to dissolve carbonates where necessary. Samples which were acid washed are labeled as such in the raw data file titles. 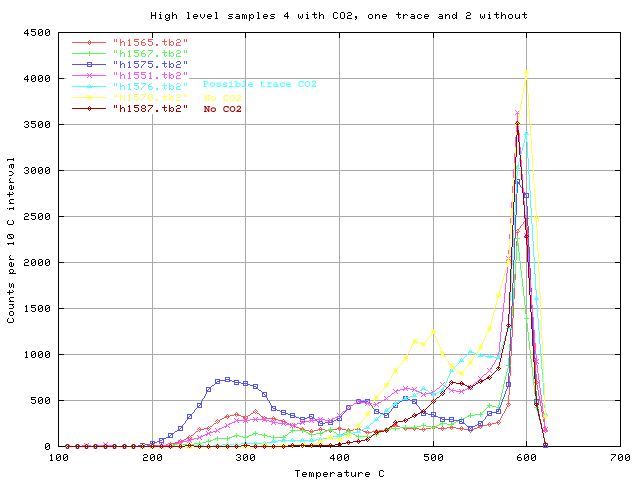 Where uncleaned and cleaned results from the same sample were obtained, these plots only show the cleaned sample results. When the geologist concerned provided sample location information, it became clear there had been a numbering problem. He claims a sample numbered 11424 was analysed, but no such sample was received at the laboratory. 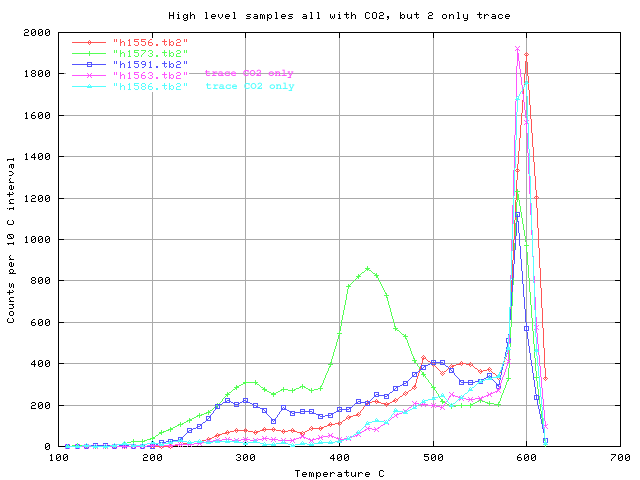 The geologist claims that sample 11424 is actually sample 11524 mis-numbered. But his sample descriptions of 11524 and 11424 differ, so this cannot be correct. Because the geologist declined to provide any sample information for 13 of the samples the data set is not closed and it is impossible to deduce which sample is the one he claims as 11424 with certainty. It is likely that the undescribed sample 11425 may actually be 11424, but the geologist refuses to resolve this discrepancy. Consequently I consider that the results for samples 11524 and 11425 and 11424 in this report and in the geological information the geologist concerned has published elsewhere must be considered as unreliable and incorrect.